The iSine 20 are in-ear monitors (IEMs) from California that take a pass on the norm of balanced armatures, dynamic drivers or a combination of the two. 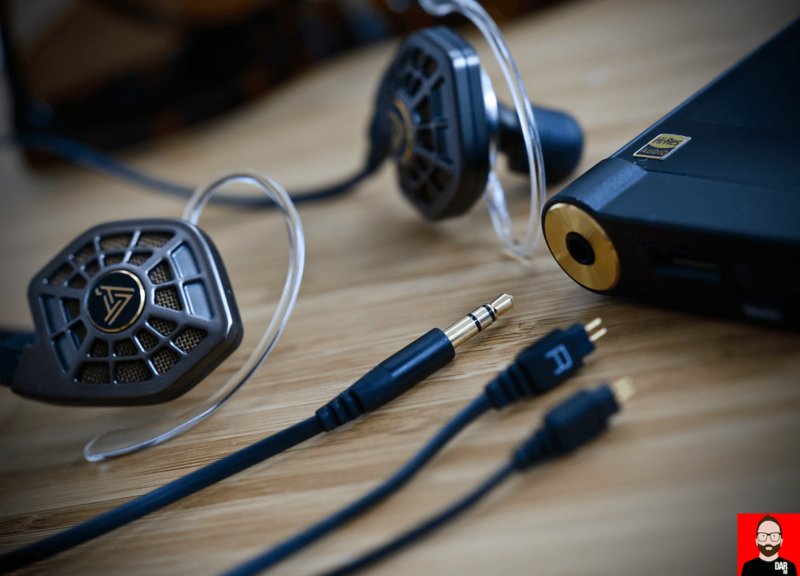 Each of the larger-than-average earpieces house a 3cm planar magnetic driver membrane, immediately behind which sits Audeze’s ‘Fluxor’ magnet system. When the source device’s electrical signal is passed through the planar driver membrane, its proximity to magnetic force causes it to flutter back and forth. Air is moved, music is made. This is the same headphone tech used by Audeze in the over-ear offerings. Big/ger-ticket models that grew – and cemented – the company’s formidable reputation in the audiophile world. 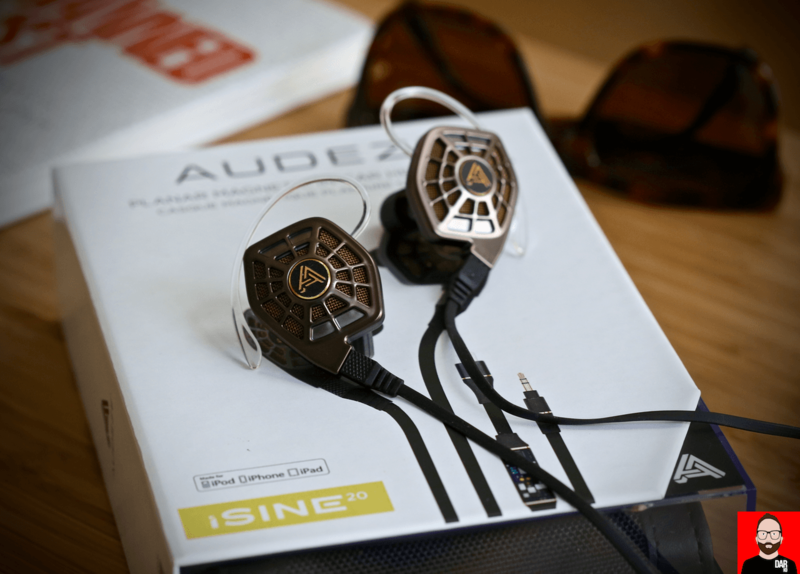 The iSine IEMs, along with the Sine on-ears, represent Audeze’s pursuit of a more mainstream consumer. Can’t afford the iSine 20’s US$549 asking price. A slightly lesser spec-d iSine 10 is available for US$349. The planar-magnetic driver – reportedly a world first for IEMs – means the iSine 20 also look different: a Star Wars Tie fighter sliced down the middle. Tipping the kitchen scales at 20g per earpiece, the iSine 20 are closer in appearance to an on-ear headphone than your common or garden IEM. Their singular output nozzle is wider too. This in turn means the iSine 20’s fit procedure is different to that of a more standard IEM. Here a little time and patience are required. 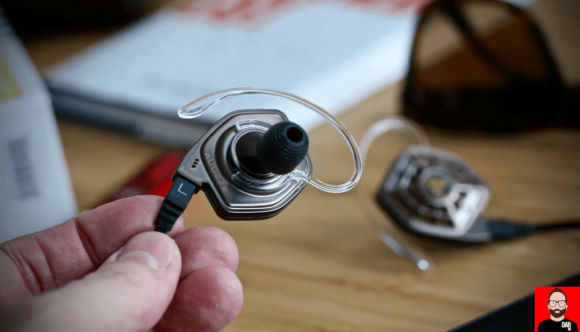 Instead of demanding a tight-ish seal within the ear canal, the iSine 20 fit more loosely. Those who don’t like the intrusion of a tight seal will find the Audeze’s comfort factor more to their liking – and you can’t say that about every Audeze headphone. Over-ear hooks (or concha-rings, both supplied) prevent the iSine 20 from falling off. This sounds more precarious in theory than in real world use. Further anchoring comes from the rubber eartips (three sizes supplied). Audeze’s forthcoming ‘Groovy’ tips, currently in beta testing, offer more stability than their smooth-surfaced counterparts. That said, the iSine 20 aren’t as workout friendly as other IEMs. Now comes an even bigger difference. Most IEMs comprise sealed, closed-back earpieces. 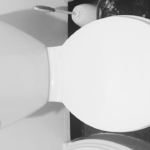 The iSine 20 are open-backed – they allow music to leak outwards. If you care about your co-workers or fellow train/plane travellers, you won’t use the Audezes on public transport or in a shared office space. The first and only time I wore the iSine 20 on Berlin’s U-Bahn, the person next to me moved to another seat. Fair enough. Similarly, the iSine 20 do nothing to shield the wearer from external noise. Out in the street, the roar ‘n rumble of traffic makes itself known over all but the loudest passages. This will either be an annoyance or a ‘feature’, depending on the desire to maintain aural awareness of one’s surroundings. And also music taste: the absence of a seal is fine for Neil Young & Crazy Horse’s roaring Weld. Less so for Nils Frahm’s Spaces. This spells a difference in deployment destination. The iSine 20 might be best used at home or another quiet indoor space with no-one else to disturb; no noise to disturb the music. Which begs the question: why not opt for a full-sized headphone? A question swiftly answered at first listen. And then indelibly inked by subsequent testing over a number of weeks. 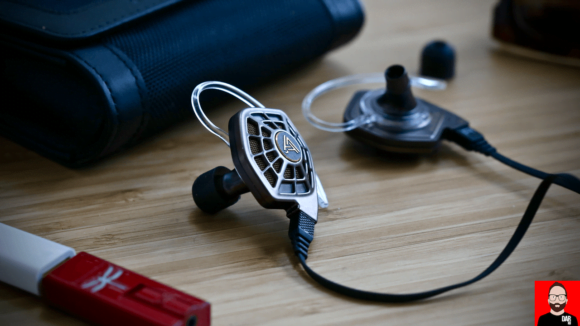 The iSine 20 sound like no other IEM at their US$599 price point (and beyond). This isn’t some generic platitude pulled down from the Book Of Audio Review Clichés. Getting specific: on headstage depth; on dynamic immediacy, on the illusion of inner spaciousness; on detail dig, on low bass plunge – the Audeze iSine 20 better Campfire Audio’s (1st generation) dynamic-driver Lyra (US$749), Fitear’s hybrid BA/dynamic Air (~US$1400) and the 6 x BA-d Rosie (US$999) from Jerry Harvey. A bigger performance delta exists between the iSine 20 and this trio than between the other IEMs themselves. Wowsers! The iSine 20 mark out fresh territory at the halfway point between a more traditional IEM and a supra-aural. The not insignificant catch is that a quiet listening space is required to reap the iSine 20’s rewards. Sealing you into their world, the aforelisted rivals convey greater intimacy/privacy; and they will go where the iSine will not — into office cubicle life and onto public transport. The iSine 20’s most prominent points of audible departure are their 1) sense of speed and 2) sense of clarity. Two more reasons why many will stretch their budget to the iSine 20’s asking price. Two reasons – but not the sole, or even most compelling, reason. A similar Cipher cable has since made its way into the iSine family as a US$50 option. For iOS users, it’s a must have: the in-line dongle not only provides microphone and playback/volume controls but relieves the iDevice’s innards of D/A conversion and headphone amplification duties in order to apply its own via a DSP-infused circuit. 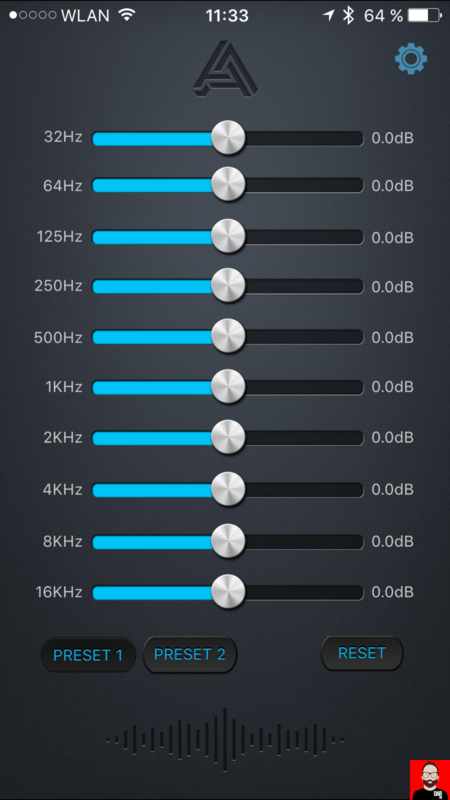 This then opens the door for end users to add their own sonic seasoning via Audeze’s iOS app. EQ settings are are set in-app before being uploaded to the in-line dongle itself – they travel with the headphones, not the iPhone or iPad. The Cipher’s talents aren’t just functional. They’re also audible. Compared to an iPhone 6S Plus’ own headphone out, we get a little more nuance here, greater low-end authority there. The Cipher-charged iSine 20 sounds more intense than the iPhone running solo. And that much we might expect. 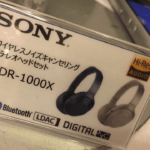 Less so is the Cipher’s ability to rescue the iSine 20 from sounding a little polite and distant when driven by AudioQuest’s DragonFly Red or – get this – Sony’s ~US$1300 NW-ZX2 portable player. Audeze have likely exploited the Cipher cable’s DSP to extract a little extra audible insistence from their planar-magnetic IEMs. More bass punch and greater presence region spice is what I hear. This markedly improved sense of immediacy makes for a more emotionally-charged listening experience, especially at lower volumes. Like the LS50 Wireless before them, the Cipher-lassoed iSine 20 give us pause. Time to consider the power of DSP and its ability to sidestep the mix n’ match lottery of DAP/amplifiers; to say nothing of a complete absence of in-pocket bulk. Cipher keeps portable audio sleek and tidy whilst maximising the performance of its downstream drivers. What’s not to like? Especially at the comparatively throwaway price of fifty bucks. Answer: sweet nothin’. This iSine 20’s detonation of sound quality expectations at their price point makes them a must listen for every audiophile – at least once. If only to recalibrate an understanding of what’s possible from an IEM at the five hundred dollar marker. If Audeze ever manage to develop a closed-back model, many a rival’s lunch will be eaten whole. The Cipher cable lends the iSine 20 mass-market appeal but with zero compromise on sound quality. Unusual in looks and quirky of fit, Audeze’s IEMs aren’t for everyone. In the city, the iSine 20’s open-backed open door make ‘em better suited to The Chemical Brothers’ Exit Planet Dust or Ministry’s Psalm 69 than Low’s Trust or Nick Drake’s Five Leaves Left. For country lifers or shut-ins, this is a non-issue – here the iSine 20 will be a life-changing listening experience. 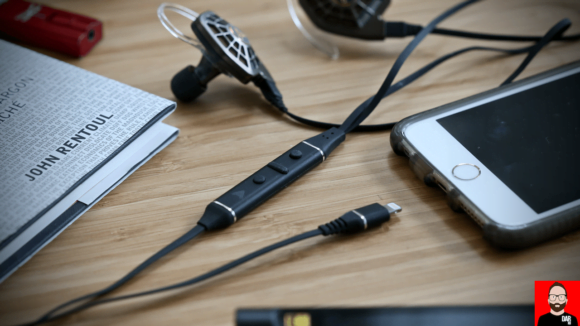 Changing the earphone game doesn’t only come down to Audeze transposing their planar magnetic knowhow onto an IEM but also their Cipher cable: in-line, DSP-optimised headphone drive that points to a world in which DAPs and/or DAC/amp strap-ons become surplus to requirements for all but the most die-hard head-fi-er. Now that’s what I call DIFFERENT. Next article Take a trip to the Schiitr! Cheers mate, got some on order arriving in a week or two. Can’t wait. The 20’s are indeed fantastic and in a different league compared to the more “traditional” multi-BA IEM. And for those of you who are wondering whether or not the i20 is a big step-up from the i10 – it is. If you got the funds, get the 20 and don’t look back. to me it is the same approach as to the dragonfly black vs red: cough up a bit more cashola (in this case for the 20s) and avoid the ‘coulda woulda shouldas’ doubts of later, always wondering what better pleasure a few more bucks would have afforded. and really it’s not all that much more expensive in the larger scheme of things. Did you try them with the Chord Mojo by any chance? Sorry Vlad – as always, if it’s not in the review, I didn’t do it. Vlad, I auditioned these briefly fed by a Mojo and was blown away by London Grammar’s ‘Hey Now’. I couldn’t compare with the Cipher unfortunately as this wasn’t set up. Didn’t seem so funny with my dog sitting next to me. He obviously hasn’t seen John Wick. I have. Terrible film! Sigh. I have an Android phone and an iPad, so a closed-back version w/ a USB-C dongle option for Android devices and things gets interesting (a Mac / PC app and USB connector option would be nice as well). I don’t see these replacing my Shure IEM’s due to the lack of isolation, but I could definitely see these replacing my closed-back Sennheiser headphones for the office. Take a trip to the Schiitr!